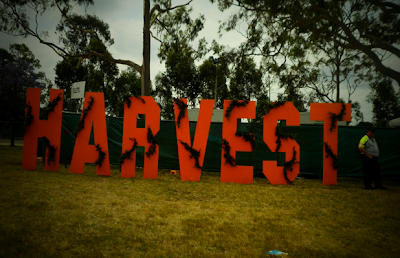 On Sunday Luke & I went to Harvest Festival at Paramatta. To begin with the day wasn't looking so good as it was quite over cast & hot, there was track work from the Central Coast through to Sydney, and we got a bad pot of organic yogurt for breakfast. 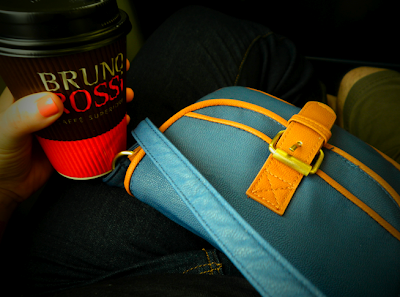 We had to take a coach rather than the train, which turned out to be more enjoyable. It was air conditioned and quiet. We got to Sydney around lunch time & had quick burgers & coffee before we made our way to Paramatta. 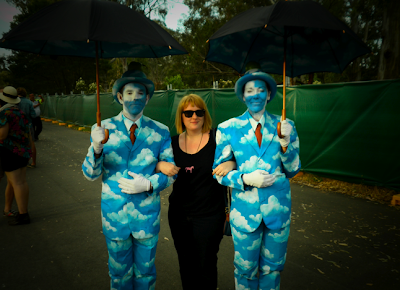 I had never been to Paramatta before, so it was nice to visit a new place & see my favourite band all on the same day. As we were making our way to the oval where the festival was being held, we were crossing at traffic lights and passed a middle aged man who went to grab me & then realised I wasn't alone & that I was with someone and snapped his hand back up and made a weird 'ohhhooh' noise. Apart from that, the midday walk to the oval was lovely! 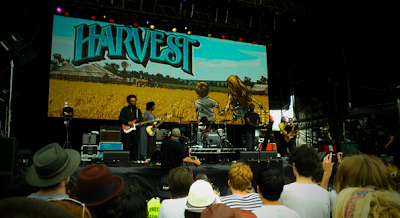 I had no idea what to expect going to Harvest, it was the first time the festival had been held & the line up was incredible but usually new festivals always have a couple of hiccups. However, the day was all kinds of amazing. When we first walked in there was a huge 'Harvest' orange letter block sign, performance artists walking around, food spots with coffee vans, and lots of cute signs everywhere. It all looked really dreamy and whimsical. 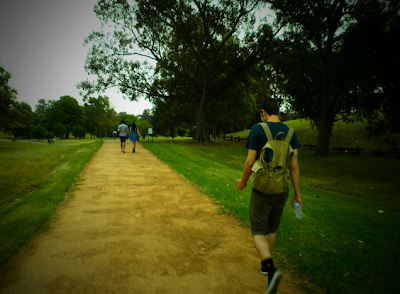 And to get into the festival there was a short walk over a bridge, and along a gravel road that looked like the set of romantic movie or something. All the stages were quite close so you didn't have to dash about all day, and most of the people that went were super chilled and friendly. The first band we saw was 'The Family Stone', then 'Tv On The Radio', a few songs by 'Bright Eyes', walked around for a bit, ran into an old work friend of Luke's, & then watched a couple of songs by 'Mogwai'. I left their set super early to wait up the front for 'The National' because thats who I really wanted to see & it was so fantastic! It was my first time seeing them, I wish I got tickets to see their side show. They played a lot of their new stuff, and a good mix of their older stuff. They played 'Apartment Story' which is my favourite National song, so that was all that mattered to me! 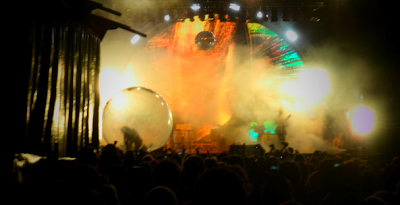 Afterwards 'The Flaming Lips' played and they had the most epic opening which involved walking out of a mystical womb, confetti, streamers coming out of a walking stick, balloons everywhere & the singer in a giant ball rolling around in the crowd. It was crazy! 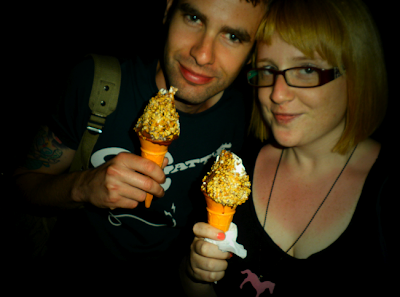 We left a little earlier so we didn't get to see 'Portishead' so we wouldn't miss a bus home as Luke had to work today. 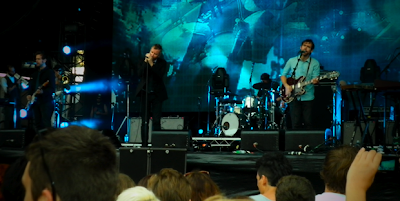 I didn't mind so much because I got to see 'The National' and a whole bunch of other great bands. It was such a bizarre, amazing festival! I'm setting up the artworks for most of this week for the Brisbane one. Can't wait to see TV on the Radio again!!! Ohhh, wow! How exciting! Tv On The Radio were fanfreakingtastic! Everyone was so into it that it made it all the more awesome! sounds super fun and the photos are adorable! The Rene Magritte love trolls look amazing! What a fantastic idea...wish I would have thought of that for Halloween!!! Ooooh, I wish I had have made it to harvest! I lurve TV on the radio!! !